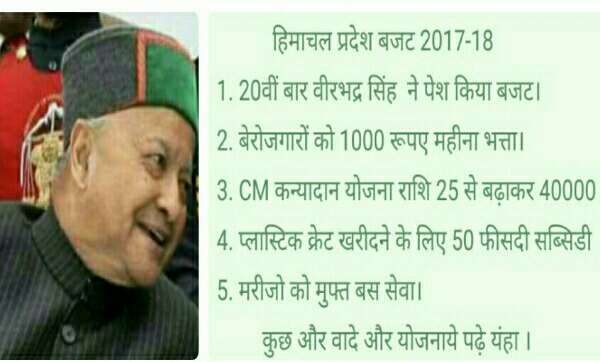 Virbhadra Singh chief minister of Himachal Pradesh presented 2017-18 budget of state and this was record 20th budget of CM Virbhadra Singh. He said in Shayrana way "Mera ye andaaz jamane ko khalta hai, itni mushkil sehkar bhi ye seedhe Kaise chalta hai "
In budget for 2017-18 chief minister focussed mainly on unemployed people of Himachal Pradesh as well as farmers of state. Chief minister said Agriculture is back bone of state and his government's aim is just good governance. He announced many new policies and some of the main announcements are given here below. 1. 12th pass and more people will get 1000 ₹ monthly allowance , handicapped unemployed people will get ₹1500 monthly. His government allotted ₹150 crore for it. 2. Subsidy on Anti-hen net increased from ₹5100 to ₹10,000. 3. Amount in 'Beti hai anmol' yojna increased from ₹5100 to ₹10,000. 4. Amount in 'CM kanyadan yojna' increased from ₹25,000 to ₹40,000. 1. For more production of kiwi in state , Virbhadra government started new plan named 'Mukhyamntri kiwi protsahan yojna' in which government alloted budget of around 1 crore rupees and announced subsidy of 50% for plants of kiwi. 2. Farmers will get 50% of subsidy for plastic crates , 2 crore rupees is alloted in budget for it. 3. For year 2017-18 around 424 crore rupees is announced for agriculture department. 4. In another important announcement under plan 'CM khet sanrakshan ' yojna for solar fencing subsidy increased from 60% to 80%. Budget of ₹30 crore is alloted for it. 5. To construct poly-house area increased from 2000 square meters to 4000 square meters. Announcement for progress in organic farming, milk production etc. - Virbhadra Singh said in his budget that in year 2017-18 steps will be taken to increase organic farming in state. He said under organic farming 2000 hectares area will be covered. 2,000 bio villages and 20,000 vermi-compose units will b constructed. - To setup poltry unit government will give 60% of subsidy to 100 units. - Government will issue health card to farmers this year. 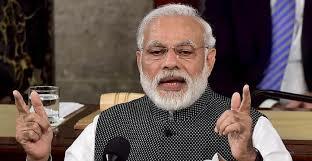 - 'Panchayat pashudhan yojna' will be started as 7.80 crore rupees allotted for that. - For setup of milk processing unit, subsidy increased from 60% to 75%. 1. Budget for Animal Husbandry Department in year 2017-18 is 374 crore rupees. - For production of off-season vegetables budget of 50 crore rupees allotted. - Free bus service for patients. - Himachal Pradesh environment leadership award will be started and under this first prize of rupees 1 lakh, 50 thousand and 25000 rupees as 1st, 2nd and 3rd will be given respectively. - Budget of rupees 42 crore for zila Parishad and Panchayat smiti in 2017-18. - Announcement of new CM rural livelihoods scheme with budget of rupees 10 crore. - 4 Lac soil cards will be issued for farmers and he also said Hamirpur was number in this. He said soil health lab is important. - Pollution control board shimla will open a local workshop which will help in control of water pollution. - Milk-seller who sell milk in milk-fed will get 1 rupee per litre extra from next budget year. Budget of chief minister Virbhadra singh is historical in many means as he had focussed almost every aspects of life. His budget was good for Unemployed, farmers , new business-persons. Government showed focus about environment, patients etc. People like this final budget of Virbhadra government or not this will be seen in future when government will face election in 2017. Elections in state is on the doors and every party and leaders are trying to get more and more support, this time a good news came for PTA, PAT, SMC teachers and outsource​ workers of Himachal Pradesh when Chief minister of H.P Virbhadra Singh said that services of teachers and outsource workers will be regularised. Chief minister Virbhadra Singh said while reply of a question in state legislative assembly that under court law and rules some steps or decision will be taken to stop injustice with these teachers and workers. Virbhadra Singh said exploitation of these teachers and workers will not be allowed who are working from a long time. He also added that some steps will be definitely taken to stop this exploitation. Chief minister said in assembly, teachers and workers will not be deprived from their rights. He said workers joined job in whatever session will be regularised under rules. Virbhadra Singh said during reply to a question, if there is lack of roaster while recruitment, that will be filled with backlog. He also added about outsource workers that for policy of workers wait for upcoming budget. Everything going to come out and if anything is wrong court is there to correct it. Unemployment allowances is a major issue on which government of Himachal Pradesh as well as opposition are always face to face and this time chief minister Virbhadra Singh cleared this issue and said Congress party have completed almost 99% of promises they made, he said about unemployment allowances that to allow it government need to look its sources and options. Virbhadra Singh said that if sources will not available how can he allow unemployment allowances. Decision of Dharamshala as second capital will not be withdrawn as this is demand of people and opposition have problem with that as they know government won on this issue. On opening of new SDM offices, schools , colleges and hospitals , he said if opposition have problem with that , tell me in written I will close that. Virbhadra Singh said his government have recruited around 43,000 people by different means, and development of departments at big level and so some more recruitments going to come. He said Himachal service commission and State public service commission have some limitations so before October all recruitments in schools will be completed. Suresh Bhardwaj and Ravindra Ravi said CM's reply as incomplete and said chief minister is trying to avoid Questions. Suresh Bhardwaj asked CM to clear if he'll give capital allowances after notification of Dharmshala as second capital to all workers. Whole story is politics will keep going but if decision of regularisation of teachers and workers will be taken it will be a good decision for them as well as congress party in upcoming elections. Yuvraj of Gandhi family and Congress vice president Rahul Gandhi is attacking Bhartiya Janta Party and PM Barbara Modi in back to back rallies. In last some days Rahul Gandhi have addressed people in UP rally , Gujrat rally and Almoda rally in Uttrakhand. This time Congress vice president is in other dev Bhoomi state Himachal Pradesh. Before Himachal Pradesh election 2017 this rally of Rahul Gandhi will be moral boosting for State Congress leader. It's important to know that state Congress is back foot with Corruption charges on CM Virbhadra Singh and Charge-sheet against Vikramaditya Singh Bushehr Tikka and several leaders by Shimla BJP. Rahul Gandhi addressed a big rally in Himachal Pradesh on occasion of 4 years completion of Virbhadra Singh government in State. Rahul Gandhi attacked PM Narendra modi in Dharmshala and said there are 1% Rich people in India and 99% poor people and Narendra Modi is benefitting those 1% people. He also said that Narendra modi did this Bombing of Demonetization on poor people but not on 94% of black money holder. Only 60% rich people have got black money. Whole country will be in hands of 50 homes who are benefitted by Narendra Modi. Rahul Gandhi said Himachali Farmers those who grow Apple , Mango , Cherry etc. get money in cash not by phones. He said Demonetization of Narendra Modi is ruining Tourism in Dharmshala and Shimla. Narendra modi did not give any money to Himachal , Uttrakhand , but he free bank loan big Industrialists. He said Narendra modi have ruined all business in Himachal Pradesh with his 'NoteBandi'. Rahul Gandhi said in Dharmshala Rally that Himachali soldiers did surgical strike on border and Narendra modi did surgical strike on poor people. He said modi did this surgical strike to benefit only 50 families to relief them from bank loan. 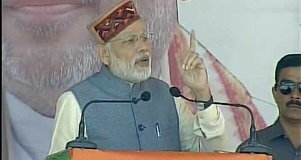 He said Prime minister will never give money to Himachal , Uttrakhand these States but he will benefit those 1% of people. Who was present in Dharmshala Rally? In rally several state Congress leader were present. Chief minister Virbhadra Singh , kaul Singh Thakur, state ministers Gs Bali, Vidhya stokes , many Congress member of legislative Assembly were present in Dharmshala Rally. Rahul Gandhi attacked Narendra modi by a Short form 'HAT' and said Narendra modi have removed 'HAT' of state . He addresses Horticulture, Agriculture and Tourism as 'HAT'. Rahul Gandhi said modi have divided country in two parts , one is poor and other is rich people. He said 'NoteBandi' is not against Corruption but it is against poor people. Rahul Gandhi said modi have transferred white money of people in pockets of Corrupt people. 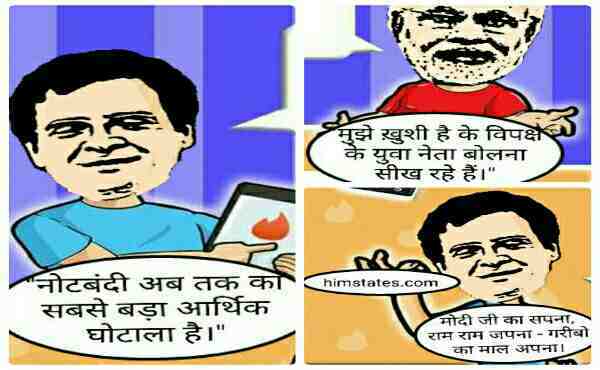 Rahul Gandhi said in Dharmshala Rally that modi ji used to make fun of him, when he ask something. He said he have no issue with fun , but at least reply his questions. Modi in Maharashtra said that I know people are getting problem but this decision is taken for better nation and to fight against corruption. He said Central government is focussed with their work and they are aware about economy. Narendra modi said in Maharashtra that opposition have also praised Growth in economy. Modi was in a function to inaugurate ' Chatrapati Shivaji Smarak' in Maharashtra. Rajnath singh , Home minister of India said today that Demonetization is never linked with Election but this decision is taken for better Indian. He said 'NoteBandi' is taken against Corruption and Corrupt people. Raja(king) Virbhadra Singh is longest serving leader of Himachal Pradesh and a charismatic leader of Indian national congress. Virbhadra Singh born on 23 June 1934 , in Sarahan of District shimla Himachal Pradesh. Virbhadra Singh have longest political career as a chief minister and politician in Himachal Pradesh. Virbhadra Singh had served six times as a chief minister of state. He will fight ho election 2017 to become chief minister for the 7th time. Permanent Address : Padam Palace , Rampur bushahr, District Shimla Himachal Pradesh. Current Status : CM(Himachal Pradesh). Virbhadra Singh born on 23 June 1934 in Rampur bushahr ,shimla district Himachal Pradesh. His father Raja Padam singh was king of Rampur Bushahr Riyasat. Virbhadra Singh is a big name in National as well as in state politics. He was elected first time in year 1962 for the Loksabha and in state politics he became member of legislative assembly in by-election in year 1983. Virbhadra Singh became chief minister first time in April 1983. He had served as six times chief minister and as a Minister of Micro, Small and Medium Enterprises between year 2009-2012 in Manmohan Singh government. He graduated in BA Honours degree from prestigious St. Stephen's College, Delhi. He married to Pratibha singh who is also politician and have 4 daughters and a son Vikramaditya singh Bushahr or tikka. Virbhadra Singh have achieved so many success in politics for a long time. He is most loved leader in Himachal Politics. He had many achievements in National as well State politics. In Indian politics Raja Virbhadra Singh won first time in Indian general elections of 1962 as a Member of parliament. After that he was elected for Parliament in 1967, 1971, 1980 and 2009. He worked as a minister for several times. In Himachal Virbhadra Singh is like a god for people specially upper Himachal. He became six time chief minister of Himachal Pradesh. * Jubbal Kothkhai Constituency : 1983, 1985. * Shimla Rural constituency : 2012. - Virbhadra Singh is king of Rampur Bushahr. - He is longest serving Chief minister of Himachal Pradesh. - He became MLA from Rohru constituency from year 1990 to 2003. - He also elected as Member of parliament for 5 times in his political career. - Virbhadra served as Deputy Minister for Tourism and Civil Aviation in central cabinet in year 1976-1977. - He was member of Indian delegations to the general assembly of UN in year 1977. - He became Minister of State for Industries in year 1980 to 1983. - He served country as a Minister of Micro, Small and Medium Enterprises between year 2009-2012. - His wife Pratibha singh is also former parliamentarian from Mandi seat. - His son Vikramaditya singh Bushahr is President of state youth congress. Himachal chief minister Virbhadra Singh present himself in front of CBI for further investigation on corruption charges on Himachal Chief minister Virbhadra Singh. Virbhadra Singh have charges of money laundering. According to sources when cbi shows evidence in front of Virbhadra Singh and asked questions he coucouldn't answer any of them. Virbhadra Singh reached at 10 am in front of cbi. He reached there in his black Skoda car. According to an officer CBI have got enough evidences against chief minister his wife and son. Sources says Virbhadra have taken responsibility on his shoulder to explain about property of his wife and son. What is whole issue of money laundering case on Virbhadra singh. On 23rd Dec 2015 a case of money laundering was registered on Virbhadra Singh and his family. He had allegations of money laundering of 6.3 crores of money during 2009 to 2011 when he was central Minister. CBI have raided his 11 places earlier this year. It's not first time that Virbhadra have been asked on this issue. CBI raided his place in shimla . Important thing to know about his issue is this issue is of between 2009 to 2011 at the time of congress government. But CBI start investigating on year 2015 at the time of BJP government. So this looks as political agenda also. Politics is really very interesting , two political leader GS Bali and sukhvinder Singh sukhu who were on target of CM Virbhadra Singh two days ago . They were sharing same stage with him in Theog rally. They didn't missed a single chance to praise CM and senior leader of congress vidya stokes. This whole picture of politics was seen in Nehru ground theog, where congress party was showing there unity. That Virbhadra Singh has done all over development , if Rampur and Theog are developing than Nagrota and Kangra is also not behind in development. Congress state president sukhvinder Singh sukhu played a marvelous stroke by saying that our cm doesn't stay in different parts of state but he stays in heart of people . 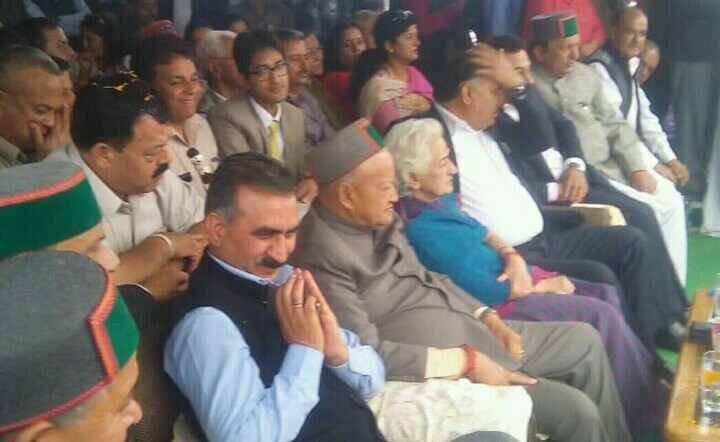 He also added Virbhadra Singh is in between people for 18 hours in a day. He also said Virbhadra singh feels bad if he is not able to work for someone. Congress state president said Virbhadra Singh will become chief minister once again in 2017. He attacked Dhumal and his family by saying Anurag Thakur likes to stay in Dubai and Mumbai than in state. He attacked Anurag Thakur by saying they are using cricket as reason for politics. Senior leader Vidya Stokes said Virbhadra Singh wants every individual's development not like BJP who have always promoted contractors. He assured Virbhadra Singh will become CM 7th time in 2017. Our views on theog rally. According to himstates this rally was really very successful, two days ago Bali was on CM's target on issue of rally of Sonia Gandhi, and sukhvinder sukhu on issue of suspension of Baldev Thakur. But this is really good sign for state congress that these leaders are together. Chief minister himachal Pradesh said there will not be any new district in Himachal Pradesh now. There are 12 districts and these are enough . He also added there is no need to make a new district ,things are doing well. We should focus on how to reduce load on government rather than making a new district. He also said that he will request prime minister Modi to come Himachal. He said Modi can come to Himachal to start Rampur vidyut pariyojna project. This project is joint venture of state and central government. 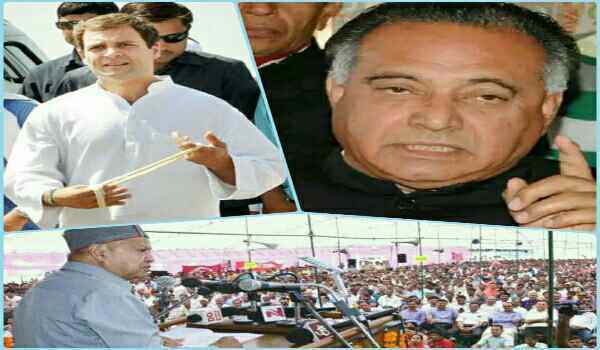 Yesterday he said that Rampur as new district of himachal is under government's consideration. He added that government want to make rampur as district, and people near region don't get problem with administrative services. Why CM want rampur as new District ? It's important to know that CM Virbhadra Singh is king of rampur riyasat and he belongs to Rampur bushehar. This is the main reason he always want to make Rampur as district .He has told many times that he will make Rampur as district. But till now he couldn't implement it. Rampur as new district is always a hot topic in state .There are two faces of this issue One is government can't afford extra load of new district as he said yesterday. Other angle with this issue is that whenever there is demand of Rampur as district, people start demanding Rohru as district. It was rohru which was earlier in news to be made as new district when CM was MLA from from Rohru. But it was never implemented, so it's quite difficult situation for Virbhadra Singh this time. As Rampur is Virbhadra Singh's home place , Rohru was his work place and won election maximum times from Rohru. It's not Virbhadra Singh, but present MLA Mohan Lal Bragta won with maximum margin from Rohru just because of him. So he can't sideline Rohru and people of Rohru. Virbhadra Singh is in big confusion he can't make one district out of rohru and rampur, and it's not possible for government to afford load of two districts. So our advise to government of himachal is ,leave this topic here only. It will be really interesting to see how BJP react on this issue. Specially BJP Rohru which are very active. 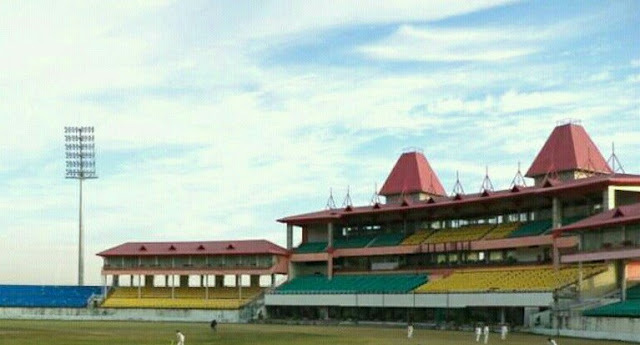 Dharamshala cricket ground , one of the beautiful ground located at god's city himachali. But it's unfortunate people of state always miss cricket action because of political leaders and bad politics of himachali Pradesh. IPL is running in India and this is cricket league season, but himachal is facing political issues with HPCA . HPCA was hosting IPL matches but now three matches has been shifted to mohali which earlier Himachali cricket association was hosting.Remember every year HPCA hosts IPL matches and it is home ground for kings XI Punjab.Now matches of 7th , 9th and 15th may matches will held in Mohali cricket ground. Is this first time match has been shifted??? No, it's not first time that matches has been shifted earlier high voltage match between India verses Pakistan was shifted to Kolkata due to security issues mentioned by himachali government. "Cm virbhadra Singh had given assurance of full security inside and outside of ground, even assured entertainment tax free matches. Matches has been shifted because of HPCA not government of himachal pradesh." "Looking at old incident of India-pakistan match we have asked government to give assurance about security in written for these IPL matches. But even after 1 week government have not replied so this shows negative response of government for IPL matches." HPCA and Bjp is saying government is not giving assurance about security but Cm had publicly announced to give security for all matches in himachali earlier . What's our view on this issue ??? Himstates feels on this issue that both parties are trying to capture public votes with this issue. Congress is trying to show people of himachal that they are against the work culture of HPCA and they are not against cricket, whereas BJP is trying to counter Bjp with allegations that congress party doesn't support cricket in state. But all-over both parties are fighting for votes, one is fighting to be 7th time CM and other is trying to make his father next CM. But himstates want to advise them ,more than politics you should focus on people of himachali.